When Prince Andrew and Prince Edward were born, some claimed that it was like a second family to the Queen. It was almost a decade since Princess Anne was born, and Prince Charles, nearly 12, was away in school. It is widely believed that the age difference between the brothers is one of the main reasons why the Prince of Wales never really got in touch with Andrew and Edward, and over the years rumors of fraternal feuds have received much advertising. 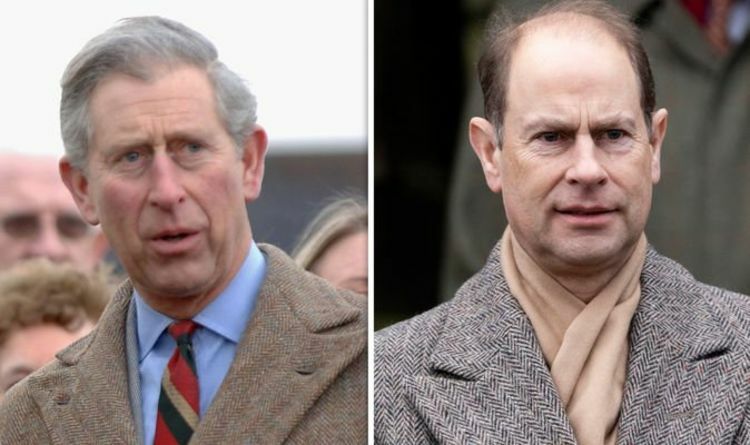 2019 The Channel 5 documentary "The Royals at War" is reminiscent of one of the most brutal clashes between Charles and Edward, reportedly occurring after the Earl of Wessex invaded the privacy of the Prince of Wales son, Prince William, in 2001. Royal writer Katie Nicholl explained: "When Prince William was at university and a very strict question from the palace to the media had expired, it would be a record when Prince William arrived after the press was leaving the prince alone. "There was a camera crew stuck around." Royal Cinema Penny Junor noted that Prince Charles press secretary found a movie crew still loitering near University of St Andrews, where William had chosen to study. She said, "They said we are working for Prince Edward, so you know, we are allowed to be here. She said," You really don't have "and everything grew into a big line." Nicholl argued that it led Charles to pick up the phone to Edward and "undoubtedly say he was an idiot and maybe some words other than that". She added: "The message was complete Ready: "You has behaved improperly Leave St. Andrews immediately. " Despite the conflict, Prince Charles is said to have had a more acidic relationship with his second brother, Prince Andrew. According to the documentary, the rivalry between the two may have been caused by the queen's obvious favoriteism against the Duke of York. Former royal butler Paul Burrell said, "I know it sounds weird but it's true. "Andrew has always been the queen's favorite son. "He has never done anything wrong in the Queen's eyes." Penny Junor agreed, "I think Andrew is a favorite with the queen and I suspect she might have a little blind spot for him." Perhaps this can be illustrated by the frostiness between Charles and Andrew over the years. The Prince of Wales nicely groomed his "responsibility" brother during the Queen's Diamond Anniversary celebration. The move was symbolic of Karl's view of the future of the monarch – because he wants it to be more "slimline". Charles, Camilla, Kate, William and Harry appeared on the Buckingham Palace balcony next to the Queen, with Prince Philip absent due to illness. Andrew, Edward, Anne and their respective families were notable for their absence. In addition, the nature of their respective military careers seems to have driven intense rivalry over the years. Charles followed the family tradition when serving in the Royal Air Force and Royal Navy. In September 1971, he began a maritime career and enrolled in a six-week course at Dartmouth's Royal Naval College. He then served on the guided missile destroyer HMS Norfolk and the frigates HMS Minerva and HMS Jupiter. On February 9, 1976, Charles took the HMS Bronington command for his last ten months of active service. Andrew, meanwhile, joined the Royal Navy in 1979. He served aboard the HMS Invincible during the Falklands War in 1982 as a helicopter pilot in the Sea King, flying on missions including antisubmarine warfare, accidents, transport and search and rescue. Charles therefore missed being "tested in action" for a few years while his younger brother took credit when he returned to Portsmouth on HMS Invincible. This, according to the royal cinema Gyles Brandreth, was something that made Charles jealous.